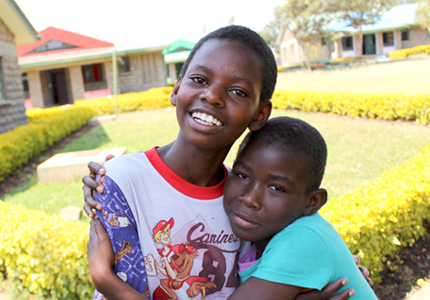 We provide a safe, loving and faith-based home for orphaned and vulnerable girls for as long as they need. In 2009 the Board of Directors purchased ten acres of land in a quiet neighborhood in Kiserian, a town an hour from Nairobi. Along with Kate, our board raised the funds to build a new permanent campus. Hekima Place now consists of six homes for the girls and their caretakers, a dining hall, administrative buildings, a large garden, room for livestock, and a borehole that provides safe, clean water both for the home and the local community. Hekima Place works hand-in-hand with the local Kajiado County District Children’s Office and is considered a model home. The District Children’s Office places the children in most urgent need of rescue and care with us. All girls come to us with traumatic pasts. Some have been orphaned, others abused or abandoned. Some are survivors of sexual violence and arrive with PTSD. Some are living with HIV and others have been orphaned by the virus. No matter their story, we meet them where they are help them heal physically and emotionally. We provide medical care, counseling, nutritious food and meet all of their basic needs. Supporting them with love and empowering them with education, we value every one of our girls for both who she is and who she can become. The length of stay at Hekima Place varies. Some of our girls are with us long-term, and today we have girls who came to us as preschoolers and are now in high school and university. Other girls stay for a short period of time, ranging from a few months to several years, and then return to their communities. We love and provide equal opportunity for each girl we receive. Even after our girls leave, we continue to ensure that they have an education for an empowered future.